These three works which form a coherent set in the CAPC collection show the same type of alterations. The polyester resin covering these photos has yellowed. Now hardened, the resin no longer plays its role of adhesive and no longer supports the objects which are working loose. 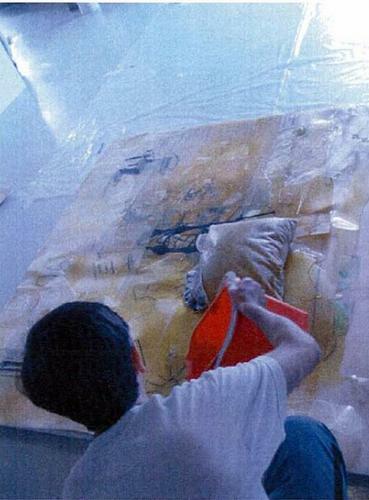 Rather than present a work in cooperation with a restaurant owner, in May 2009 the artist decided to re-intervene on his own. He consolidated each work with an epoxy resin especially formulated for him by chemists, and laid woven fibreglass on the back of the work Recherche du confort. Metal eyelets placed at the corners of each painting have helped to fix these two homeopathic paintings on a stretcher with canvas the same dimension as the works in order to simplify the work’s hanging and conservation.